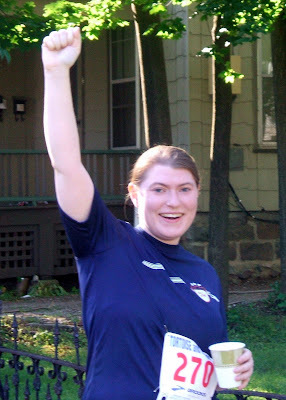 RunningAHEAD - Topic: First 5K Race EVER! I didn't come in last! PR for pace! Pics! Today was my first race ever. If you had gone to me as a sedentary, PE-loathing teenager and said, ''Hey kid, you're going to run in a 3.1 mile race someday,'' I would have asked you what you were smoking and where I could get some. 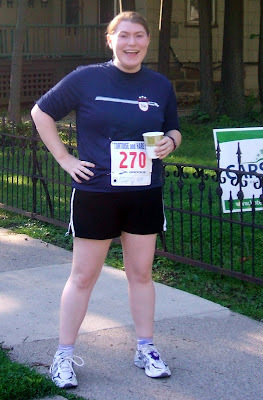 * *j/k, I'm totally clean Even starting the C25K, I was very My god, how I used to hate running. I remember ''running'' the mile in gym class, how tortuous it was and how I usually ended up walking after about 1 minute of jogging. We went out yesterday and ran an easy 1 mile (I pushed it a little), it was a 13:47 which was our fastest pace yet. So today was the day we'd all been waiting for... the ''Tortoise and the Hare'' 5K 4th of July Race! Man, was I nervous! I really started to feel faint at about 3 minutes before showtime. I'm not sure what I expected to happen to me, but I had the butterflies for real. There were a LOT of people, and I'm not used to running with anyone but my husband. My husband is a good man. He was a cross-country runner in high school... his PR for distance is 13 miles and he can run laps around me, but he always chooses to stay right by my side. Well, things were a little confusing out of the gate, because I got a new toy that wasn't functioning properly (Nike+ SportBand), so I was running faster than I originally planned to begin with. I realized about a half mile or mile into the run that I was going to have to work to pull this one off. I was starting to get discouraged with how tired I felt, when my husband said to me, ''If we stay on this pace we're going to make a PR.'' Isn't it amazing how something like that suddenly gives you all the fortitude and energy in the world? I suddenly didn't feel quite so tired. I'm not laboring under any delusions about my pace or anything. I know I'm slow. We got passed by speedwalkers. When the people standing on the corner shouting supportive words of encouragement waved hello, I said, ''Thank you, thank you. We'll be here all week.'' (So it felt like it was going to take a week to reach the finish line.) So I was working hard, but I guess races are where you're really supposed to pull out all the stops, right? If not now, when? So we finished in 42:05. I was so deliriously happy to hit that finish line I forgot to stop my watch. Not only did I finish, but I set a PR for 5K. Not only did I set a pace PR for 5K, but... I set a pace PR for EVERY DISTANCE I'VE EVER RUN, EVER -- including that superfast mile from yesterday. To put this in perspective... my last 3 mile training run was 15:35/mile pace. This 5K was 13:35/mile pace... TWO MINUTES faster. I mean, I was booking! (for me) So there's the happy story. I got to put a little red bar in my Running Log for the first time ever. And I got a free t-shirt (it's awesome, made of that sporty material.) And 4th of July is my favorite holiday. And I can pretty much do whatever I want for the rest of the day without getting accused of being ''lazy''! I couldn't be happier! Just call me the Little Slug That Could DID! Ditto to this. Nice job Slug! And I must say, I love (and live by) your slogan in your signature. Congratulation are certainly in order for finishing your first 5K! I was in the same race today. The weather was great, especially after the way it has been here . . humid and hot. So today at 56 degrees with lower humidity it made for a nice run. Keep it up and see how you do next year in the same run. Hey Christy, where are the "after" pics??? You look pretty fresh in those.... Great job!
" Choose Joy, Today and ALWAYS"
Christy, congratulations! I'm so happy for you. Your DH is definitely a keeper. You remind me so much of ME!! 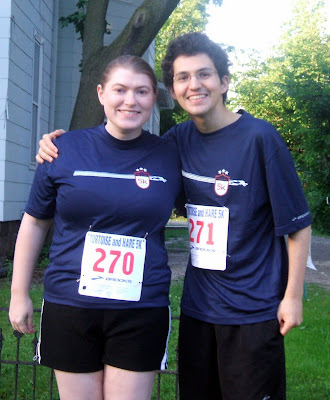 My first 5k a year ago was about your same time, and I felt the same way you did about PE - ychh. I wish someone back in 7th grade had told me it was OK to run slowly and to start out with a very short distance! So now you're hooked?? It will be fun to see how you do this next year. Hooray! Very nice job! I ran in A2 this morning as well, and for your first race you had a beautiful day. Glad to hear that you exceeded your goals - Always a great feeling! So what race are you planning on running next? Goodness, we hadn't thought about it Tony... we're moving out to New Brunswick, NJ in a month, so I'm sure there are a ton of events in that area, and also it's very close to NYC. My favorite part about our new place is the 4.3 mile running trail extending from our parking lot through a 65 acre park across the river into a 600 acre park and back. Seriously, our backyard is a race track! Too exciting. It looks like there is a 10K at the end of August not too far from our new residence, so that might be worthy of consideration. I guess there is a good deal of investigating left to do. Congratulations, and I don't know when i have seen a prouder smile on a husband's face! Simon. Great job!! congrats!! Don't worry about your pace being "slow"... it's a whole lot faster than a lot of people and hey you ran it, you did it!!! Awesome!!! Congratulations! You. Go. Girl! I like your humor: ''Thank you, thank you. We'll be here all week.'' (So it felt like it was going to take a week to reach the finish line.) That will serve you well, because running should be fun. Or ya gotta be funny to do it. I wish you continued good luck!